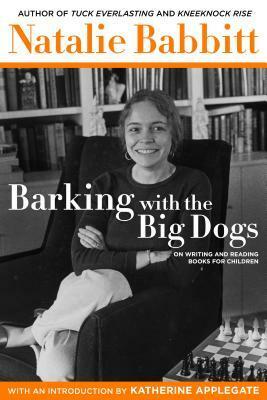 In chronological order beginning with the year 1970, Barking with the Big Dogs presents the late children's author Natalie Babbitt's essays and speeches about reading and writing for children. My feelings about this book were all over the place as I followed the essays through time. During the first half of the book, well into the writings from the 1980s, I found myself wondering why this book was being published today, and for whom. At that point in my reading, it felt as though Babbitt had one main argument, that writing for children ought to be taken seriously, and it seemed to me that, in the 2010s, we had moved beyond the simple question of whether children's writers "count" and on to more interesting ones. I wondered what a contemporary audience had to gain from reading different versions of this same argument over and over again. I also found myself cringing over some of Babbitt's other pronouncements of the 70s and 80s: her assertion that public education was making great progress (toward what? I wondered), her idea that reading needs to always be "easy and pleasant" in order to make people want to do it, and all her weird comments about books for teens. But right around the time I started feeling fed up with Babbitt, her essays started expressing unpopular opinions that I actually agreed with! In one essay, she said that we can't reasonably expect everyone to love to read. I think this idea has always been nagging at the corners of my mind whenever people speak with disdain about those they encounter who do not read for fun. There are a lot of things I don't do for fun, and I don't think that is necessarily a character flaw. Not loving to read sounds horrible to me, because I do love it, but it is not objectively horrible. I appreciate that Babbitt had the good sense to recognize that fact, and the guilty burden it puts upon educators when the bar is set so impossibly high. In her essay from 1989, "The Purpose of Literature - and Who Cares?" I also enjoyed her glib response to an audience member during a Q & A session who asked Babbitt why she didn't address more of society's problems in her novels. The fact that Babbitt dismissed the questioner with the statement that helping children deal with problems is not the purpose of literature made me cheer. Here we are, thirty years in the future, and every author wants to make sure that the problem he or she experienced during childhood makes it into a book so that kids who are experiencing it now can see themselves in fiction and feel comforted and understood. But Babbitt makes the point that it is really difficult for an author to write a book that both addresses societal issues and is still a pleasure to read. I have found this to be true of many contemporary books. They get across the problem, but the stories feel like they are trying to instruct, and not entertain. On a related note, in her 1990 piece, "Protecting Children's Literature," Babbitt also criticizes the idea that children's books be used to teach social responsibility, and explains that she doesn't "believe in using fiction to teach anything except the appreciation of fiction." She points out a tendency that bothers me greatly in our own current culture: the idea that we need "to catch the children early and get them to think about things in the right way." She concedes, as I do, that children need to be taught how to treat others and get along with them, but she does not believe, as I also don't, that books need to be written in such a way as to preach morals at children. She seems to suggest that it's better to present kids with questions, rather than lessons, about morality, and allow them to begin thinking through their own answers. In the end, I found that I really enjoyed this collection as a whole. I did feel that I wanted more context, as all we really have is an introduction by Katherine Applegate and a short Preface by Babbitt, and it did sometimes feel like Babbitt was shouting into a void and I didn't know to whom she was really addressing her remarks. I also think it would be foolish to filter all of these essays through the lens of a contemporary critic. This collection is really a history lesson about the changes in children's literature over the last nearly fifty years, not a single cohesive unit arguing toward one point of view. I did not enjoy Tuck Everlasting as a kid, and found the ending of The Search for Delicious disappointing, but this is one Natalie Babbitt book I would recommend to all those who think seriously and critically about the books written for children, then and now. Whether you agree or disagree with Babbitt, there is much here to think about and discuss.